Package contains standard running functions (aka. windowed, rolling, cumulative) with additional options. runner provides extended functionality like date windows, handling missings and varying window size. runner brings also rolling streak and rollin which, what extends beyond range of functions already implemented in R packages. Install package from from github or from CRAN. window size k denotes number of elements from i-th backwards, where functions are calculated. k can be also specified by vector of the same length as x as illustrated in second example. argument na_rm=T handling missing and is equivalent to na.rm. na_pad=T if window size exceeds number of available elements, than first k-1 elements are filled with NA. idx to calculate within time window. idx is a date (or numeric) vector of the same length as x. k then should to be an integer specyfying time window span. 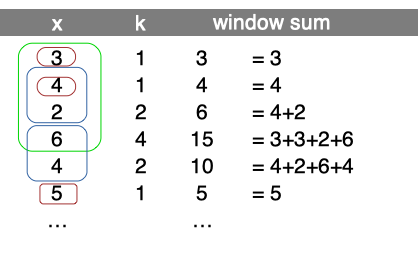 In the example k=5 window sum. Function creates list of windows. Because runner provide limited functionality, one can create running-window-list which can be further processed by user to obtain desired statistic (eg. window sum). x is a vector to be 'run on' and k is a length of window. 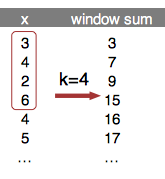 In this example window length is varying as specified by k. Provide one value to obtain constant window size. Such windows can be used in further calculations, with any R function. Example below shows how to obtain running sum in specified, varying window length (specified by k). One can also specify window based on a date of other numeric index. To do this date should be passed via idx argument and k should be integer denoting date-window span. User can use unique_run create list of unique elements within specified window size. #>  "a" "a" "b" "a" "a" "c"
Runner provides basic aggregation methods calculated within running windows. Below example showing some functions behavior for different arguments setup. Let's take a look at 8th element of a vector on which min_run is calculated. First setup uses default values, so algorithm is looking for minimum value in all elements before actual (i=8). By default missing values are removed before calculations by argument na_rm=TRUE, and also window is not specified. The default is equivalent of base::cummin with additional option to ignore NA values. 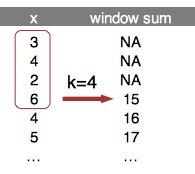 In second example within window k=5, the lowest value is -3. In the last example minimum is not available due to existence of NA. Graphical example is reproduced below in the code. Function used to replace NA with previous non-NA element. To understand how fill_run works, take a look on illustration. 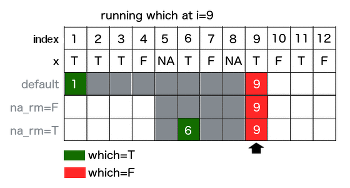 Row 'x' represents, and another rows represent replaced NA by fill_run with different options setup (run_for_first=TRUE and only_within=TRUE respectively). By default, fill_run replaces all NA if they were preceded by any value. If NA appeared in the beginning of the vector then it would not be replaced. But if user specify run_for_first=TRUE initial empty values values will be replaced by next non-empty value. Option only_within=TRUE means that NA values would be replaced if they were surrounded by pair of identical values. No windows provided in this functionality. To count consecutive elements in specified window one can use streak_run. Following figure illustrates how streak is calculated with three different options setup for 9th element of the input vector x. First shows default configuration, with full window and na_rm=T. 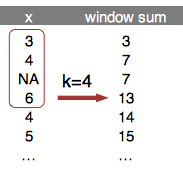 Second example count within k=4 window with count reset on NA. 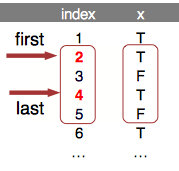 Last example counting streak with continuation after NA. Visualization also supported with corresponding R code. To obtain index number of element satisfying some condition in window, one can use running which. Functions from this group returns index while condition is TRUE appeared before n-th element of a vector. In below example whicht_run function returns index of element containing TRUE value. If na_rm=T is specified, missing is treated as FALSE, and is ignored while searching for TRUE. While user set na_rm=F like in second example, function returns NA, because in following window TRUE appears after missing and it's impossible to be certain which is first (missing is an element of unknown value - could be TRUE or FALSE). all functions have additional idx argument which allows to compute running windows within specified date/time/indexes range. added lag_run function - lagged value able to be computed on date/time lag. added length_run function to compute number of elements within specified date/time/indexes range.